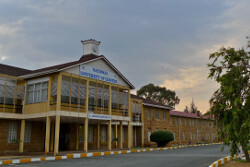 A task force comprising ICT directors from seven higher learning and/or research institutions has been established to fast track the formation of a National Research and Education Network (NREN) in Lesotho. The “Task Team” as it is being called, was proposed during a ‘Lesotho NREN sensitisation workshop’ that was held in the capital Maseru on 18 May 2016. Senior representatives from the Center for Accounting Studies (CAS), Institute for Development Management (IDM), Lesotho College of Education ( LCE), Lesotho-Boston Health Alliance (LeBoHA), Lesotho Polytechnic (LP), Limkokwing Univeristy of Creative Technology (LUCT) and the National University of Lesotho (NUL) and others from various government departments and agencies including the Lesotho Communication Authority ( LCA) attended the workshop which sought to find ways and guiding principles on how the country’s research and education institutions can collaborate to initiate the formation of an NREN. As one of the major steps in the creation of the NREN, participants to the workshop agreed on the formation of a task team that will be mandated to develop a compelling plan, guided by agreed principles, for the launch and operation of the NREN. UbuntuNet Alliance was represented by its consultant Dr. Duncan Martin who provided insights and shared with the delegates best NREN practices and success stories from other UbuntuNet Alliance NREN members. Dr. Martin was invited to the workshop alongside other four experts from South Africa who also gave presentations on various aspects of research and education networking. Among others, the workshop agreed that immediate priority should be given to establishing a high speed Internet network as institutions in the country urgently need connectivity at much greater bandwidth than they have at present. It was also agreed that the NREN should start off as a project that will be hosted by one of the represented institutions but overseen by a steering commitee comprising of members from all concerned institutions. Lesotho is one of the 11 of the 26 countries from the UbuntuNet Alliance region that are yet to register as members of UbuntuNet Alliance. Currently, research and education institutions in the country pay an average $167 per Mbps per month for connectivity from commercial Internet Service Providers.